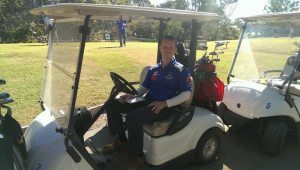 So you are interested in playing Masters AFL? Straight into it this week lads, no mucking around though I do just want to put it out there that I will not be in attendance for our next game so if anybody wants to write a match report for the next game, you are more than welcome to do so. We’re used to losing players prior to the commencement of a game at our level of competition, be it to injury, incarceration or just down the back of a couch (it could happen…Mary is only little) but the monotonous regularity with which we now lose Bones pre-game is becoming a cause for concern and ridicule. With each new game, Bones’ withdrawal seems to come a little earlier. For this game he called an end to his fitness test one minute into his warm up. Be sure to watch for him next game driving his pre-game warm up laps instead of getting out of the car, just to save time. Whilst we’re on the subject of the Huston brothers and their pre-game routines, I should point out that even just sitting next to one comes with its own set of hazards. In error I found myself drinking from Pedro’s pre-game Powerade, which either he’d already started using as an ashtray or they’ve introduced Winfield Red as a new flavour. I came away from the experience with a strange new set of cravings. I wonder if Powerade sell patches? The Redcliffe ground is set against a lovely, semi-rural backdrop that is as sedate as it is welcoming. If I had to knit pick though it would probably be in reference to the enormous, seemingly genetically engineered mosquitos that engulf the ground. The standard repellents did nothing. Usually my personality acts as repellent enough to most living creatures but these were no ordinary insects. When you see a group of them (presumably teenagers) standing around, drinking from a can of Aeroguard, you know they’re tough. It was by no means an aesthetically pleasing game but rather one played with great passion and desire. Even the perpetually smiling Brian got fired up at one stage. Not to be outdone Wolfie soon found himself in a little push and shove. Both combatants went toe to toe and eye to stomach until they could be passively restrained. The big guy had the last laugh though, responding shortly after with a strong contested mark before drilling Haema on a lead with a beautiful pass. *Haema kicking 3 beautiful set shots for goal. * What I suspect was Nicko’s finest game for the club, predominantly off a half-back flank. * Micky “Mouse” Joyce maintaining a tightly run board as Sparksie continues to coach away games via correspondence. Joycie’s impassioned pleas, urging the team at half time not to be “Wallflowers” seemed to give us the required lift, perhaps fearing any further comparisons to other forms of decorative arrangement. * The War Horse, the Old General himself, Burger pulling out a vintage display of ruckwork around the ground in what many are calling his best game in recent memory. There are records of him having better games than this one but those scrolls are presently on display at the Museum of Ancient History and can only be viewed by appointment. * Chris (“Corky” last season but apparently “Buffet” this year) had his finest outing for the club, an absolute cracker. For the record, Cracker doesn’t need permission to take on tacklers. The people closest to him have been trying to hug him for years but he just instinctively puts out the “don’t argue” and is away. He just never stopped working…which, for an airline steward, is standard. At game’s end I saw him ushering both teams towards the exits before moving over to ensuring everybody on the bench was once again sitting up in the upright position (thanks Mel for this joke…I love you). Great to see TD back in the Shark’s jersey and making an immediate impact. TD covered a lot of ground and some of it was even in the right direction which is always encouraging. The laws of the game state that there should be 4 changes of end per game. The ever efficient TD just decided to get all four end changes over in the one passage of play. The last quarter played out as an enthralling arm wrestle with both sides scoring 1 point apiece, ensuring we held on for a stoic victory. An effort made even more wonderful given the absence of Mary, Peter May, Docko and Princess to name but a few of the several who remain clinging to life in the wake of our bruising home game two weeks earlier. Thank you to the two lads from Morningside who graciously filled in due to their own club suffering a sudden lack of team. Great effort boys that had us singing the song with gusto. The Supers game started at break neck speed with a Redcliffe goal in the first 60 seconds of play and Hoops responding shortly after with our first. There was some initial difficulty with the electronic timer on the scoreboard which didn’t start counting down for the first quarter, causing some issues for all concerned. It was being run via a laptop computer, presumably running Windows 10 and even after consulting with the spectator with the thickest glasses, who it was assumed would know about computers, it was left to simply reboot before the second quarter in order to fix the problem. This game, for me, produced some of the finest transitional football we’ve seen from the club this year. Usually starting with some pack bursting runs from Simmo, Pipes or Tank. The irony should not be lost on anyone that Tank’s graceful bursts of speed and mobility come in precisely the same way that a tank does not. To be able to witness, first hand, this incongruous cocktail of girth and grace, like a Blue Whale on roller blades (which, I’m lead to believe, is truly one of nature’s great sights.) was nothing short of an honour. Closing out the backline, newer guys Dan and Gus had impressive games across half back and have blended seamlessly into the Shark’s culture and structure and Pipe’s clearance work is better than National Tiles and Rugs a Million combined. The insurgence of mozzies continued well into the second game and had us all scratching like Lindsay Lohan at an intervention. Jar Head will be on injury watch this week after he was sent crashing to the deck and limping off in a dramatic slow motion not seen since the early days of Baywatch. By the closing stages of the 3rd quarter the boys looked spent and that they would be denied again courtesy of some fundamental skill errors that belied their efforts. However an early, last quarter snap around the body from Nicko (and getting anything around that body, other than satellites, is no easy order let me tell you), would prove to be the catalyst that would wrest momentum back in favour of the Sharks. A feat of individual greatness that we will all no doubt read about on Facebook for many weeks to come. Despite some indifferent form throughout the early stages of the game from Skull, it would be the handsome one who would stand up and be counted for when it mattered most. With only a couple of points in arrears, Skull picked up a loose ball and, displaying the sort of calmness he normally reserves for hiding in the bushes outside other people’s homes, he slotted an absolute beauty from hard against the boundary line. With the game now in the balance, a minute remaining on the clock and the ball deep in our forward fifty, President Haema showed admirable desperation on all fours and under extreme physical pressure, as though having dropped a dim sim in a mosh pit, to farm out a handpass to the omnipresent Skull who then kicked the sealer. A huge shout out to the raucous cheer squad of Pedro, Bones, Burger and Yats on hand to offer advice to anyone in earshot and who never stopped believing the boys could do it. Their sledging of the opposition was sometimes informed, often personal and largely incoherent to the point where it must have helped wear the opposition down. On the subject of drinking we’d also like to thank the good people at Liquorland for supplying this week’s umpire whose passion for 50 metre penalties should keep the liquor franchise in business for many months to come. Well done lads, inspired stuff. I’m not sure there are enough words to describe the depths of physical and emotional torment I was witness to this weekend. It will forever stand as a testament to the frailty of the human condition as unrelenting scenes of soul destroying carnage played out before me. Rest assured that’s the last episode of Daryl Somers’ You’re back in the Room I’ll be watching anytime soon but enough about that, we’re here to talk about football. For our first ever home game in the more affluent suburb of Kenmore I elected to arrive early and take in the ambience. Sprawling estate homes and majestic foliage cloak the ground. I think I even saw a bird wearing a monocle but that might have more to do with that bottle of cough mixture I drank for breakfast. Junior Rugby Union matches provided a festive atmosphere and had chauffers winding the windows down on their limousines and Bentleys just long enough to have their occupants offer the dignified cries of “Jolly good effort Master Edward!” And “Wash your hands after tackling the poorer children, darling!” before the whirring of tinted glass had them withdrawing once more from contact with the standing peasantry. It’s the first time I can remember drinks being run out to players on a serving tray accompanied by hors d’oeuvres …but I digress. Naturally, we are all quite keen to put the Shark’s indelible stamp on our new surroundings and in the process make it feel like home. Whether that be through positive social engagement or a campaign of mindless graffiti, remains to be seen. The slightly smaller change rooms will take a little getting used to and let’s just say that I hope our opposition provide more pressure than the showers do. I found some of the line markings a little hard to see so spare a thought for more weather beaten Master’s eyes like poor old Floater who had to break out the prescription safety glasses just to read the sign on sheet (to say nothing of him trying to tackle an unsuspecting jogger mid game). At least he wouldn’t need them to locate the outrageously bright boots he was loaned for this game (Sparksy’s I think). When you need to recharge them at half time and wear a welder’s mask to put them on, I’d suggest they’re a little too flamboyant. It was around this time we discovered that our playing shorts had an internal pocket. Theories vary as to their purpose from safe storage of reading glasses to somewhere to tuck a hernia into (Docko’s suggestion). I just think it’s a nice little alcove for Master’s players to keep their ID bracelets in the event of wandering off and finding themselves tired and confused in someone else’s backyard, 3 suburbs away. Bounce down and it wasn’t long before hopeful optimism turned to thoughts of self-preservation. We started dropping like flies from the virtual outset of the game. I was myself, the first among a long list of injuries for the day. Nevertheless, I courageously went back to the field of play once numbers began to thin on the bench, before courageously buying a pie after the game and later, reading a book before bed…in courageous fashion. A thank you to all for the concern but the thumb does not appear to be broken, though my burgeoning music career will need to be put on hold (I play glockenspiel in a Susan Boyle cover band). Sadly, where losing my input would normally lift the team’s spirits this only served as a catalyst to invoke further injuries. Most worryingly the suspected broken collarbone suffered by Princess. He soldiered on for as long as he could under obvious duress but won’t be able to perform a number of overhead duties for quite sometime, whether that be standing up on a moving train, hanging out the washing or spelling out YMCA on any upcoming trips to The Beat. Poor Pete May was belted from pillar to post with little love from the umpire. The Rolls Royce that is Pete was left to running like Leyland P76 by game’s end. Kingy and Mary battled endlessly against insurmountable odds. Kingy did well to return to the playing field after being unceremoniously poleaxed from behind in a challenge that was both late and high and still didn’t receive a free kick. I find it a little suspect when you ask an umpire what you have to do to get a free kick and they immediately quote you their BSB and Account number. Presto continues to impress with his physical signature. Rumour has it that there are no doors in Presto’s house, preferring instead to run through the wall in order to change rooms. Pedro played well, in particular his tackling (or aggressive cuddling as he prefers to call it) was a highlight of his game. Roger and Docko stood tall down back. Some experts have likened the unforgiving regularity with which they stood under constant bombardment, to that which we’ve come to expect from Brian’s E-mail updates. Nugget never stopped trying also. It wasn’t all doom and gloom though. Rocket slotted a nice goal from the pocket that even the Sunshine Coast boys celebrated. Watching big Kev and Burger try to chase down an opponent at speeds approaching glacial allowed me to consider firstly, how much more impressive it would look in time lapse but importantly, just how concerted an effort the boys made under trying circumstances. A disappointing loss but a game played in good spirit nonetheless. Conversely, the Supers jumped out of the gates early and looked to be building on their efforts from game 1. Hoops worked hard as ever, reaping the benefits by kicking some nice early goals. For one of his goals he literally kicked the air out of the football but the real tragedy lies not in a deflated football but more in Sparksy kicking the offending footy from the ground, into the interchange area and directly into his carefully positioned beer. I’m not sure exactly how much beer he spilt but I do know that Burger spent an unusually long time in that exact same spot shortly after, on all fours, with a straw and claiming to be looking for a lost contact lense…so probably a significant amount. Wizard and Deethy (I hope I pronounced that correctly given I’ve been provided guesses of Beefy, Teethy and Fifi since his arrival) joined the cavalcade of injured by doing hamstrings within minutes of each other. What ensued was a desperate campaign of dragging in last minute replacements from the bar, like poor old Kingy who was at least 2 knuckles deep into a bucket of heavily sauced chips when he answered the call. Docko would soon be forced to reappear as would a spritely Haema (understood to be in training for something he’s calling The Fridge to Brisbane), who soon found himself at full forward. Alas, the carnage continued with Brendan leaving the playing arena with a hand injury and Kingy, feeling left out as one of the few uninjured Masters, wasted no time in dislocating his finger. Pipes played well. There’s no story in that but he harassed me at training about not mentioning him last time and frankly, I don’t need the hassle, so let’s just say that he covered the ground majestically, with all the poise and balance of an ice skater, minus the sequined tights. Tank was also among the Super’s best and nearly took a screamer before crashing heavily to the deck with a sickening thud felt by many on the sidelines, the impact of which caused Nicko to drop several of his pies. The bruising nature of this contest left me to postulate that this may in fact be the most heavy, physical contact that any Shark player has been subjected to since the last time that Skull tried speed dating. It didn’t end there unfortunately. Dutchy was soon coming from the ground, dribbling from the mouth…only with blood this time and Senior Constable Smartie did either an ankle or hamstring in the fading embers of the contest. Not even the goodwill and encouragement of the injured masses, lead cheering from the sidelines by a conspicuous Mousey, sporting an impressive beard that now serves as home to a troupe of endangered gibbons, would prove to be enough to get the boys over the line. A 10 point loss would be all the lads would have to show for their toil, against a quality opposition, that was further restricted by the early departures of Hoops, Murph and others due to external commitments. In all this carnage, spare a thought for young Michael who thought he’d signed on to apply a little strapping here and squirt a little liniment there but nothing quite of this magnitude. Remember that scene in Gone with the Wind where the camera pans out to show thousands of infantry in need of medical attention? It’s just like that, only with fewer moustaches and whale bone corsets.It’s right before that scene where the cheerleaders have that pillow fight…actually…I might be confusing that with a different film. Nevertheless, he was confronted by the full spectrum of injuries from this game. Whether it be breaks or sprains, hamstrings, collarbones or thrush. You name it, he was repulsed by it. Let this be a lesson to the young man though. This is what happens when you don’t properly read a contract written by Haema. You should always demand to know exactly what demands are being stipulated, especially the ones covered by gravy stains. That said, if the measure of a club’s character is how it plays under adversity then I’d say we’re in pretty good shape…figuratively speaking of course. A bold and determined effort by all involved. It makes me proud to be a Shark. It's been a while guys so bear with me. Ideally what I will try and do is make the match reports different to the ones I've done in the past, starting by making them interesting, informative and grammatically correct. 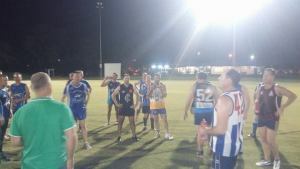 Footy's back and as a collective we kicked things off with the majority of us playing Sandgate and Peter May deciding to take on Aspley instead, at least until a timely phone call was able to properly synchronise Pete with the club's official fixture. Everybody knew Round 1 would be a tough assignment with unseasonably warm weather greeting our arrival to the ground. But, as mature aged athletes, we all know that there are times when we will need to endure. Whether that be the onset of regular injury, joint related stiffness or just having to sit through one of Burger's speeches at The Awards Night. 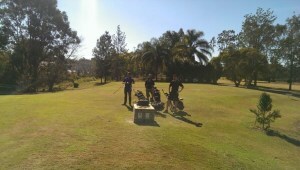 Things started the way they normally do when you play at Sandgate, with the boys really struggling to find space. Something really needs to be done about those change rooms. Nerves and inaccuracy meant we were hopelessly inadequate at capitalising on the numerous opportunities we were able to create but fortunately our backline remained largely impermeable throughout. Simply put, Docko spoiled everything: Long kicks, short kicks, the plot points to the upcoming series of Game of Thrones, you name it...he spoiled it. I tried passing on some feedback to Mary at half time but Docko intercepted that too and punched it out of bounds. A huge thank you to Skull for lightening the mood at half time by wearing a pair of shorts that he must have purchased on either a Senior's Cruise or at a Beach Boys Reunion concert. Amongst the many impressive debuts for us, allow me to single out Manny who was exceedingly busy, finding space with regularity and Yatala Pete, sidelined because he now boasts a pair of heel spurs so pronounced that he can now sleep upside down in a cupboard...if he wanted to. "Yats" performed extremely well given the restrictions of a limited bench, swinging the rotations and ensuring that blokes were rested whenever feasible and that Haema and Nicko were moving predominantly downhill. Mary was tireless in work rate and reigning Skipper/Best and Fairest Kingy (long may he reign) lead by example slotting 4 goals. Princess provided a reliable target up forward and the physical brand of football that Presto brings to the club deserves special mention. Sure, his aggression might look to be restrained a little at times (I did see him trying to pick a fight with his shadow at one point) but there can be no doubt that he has genuine presence when he's out there. Wolfie took some impressive contested grabs from long bombs in a display that had him turning back the clock (only by a few minutes perhaps) but any display where the big man gets off the ground without assistance from either hydraulics or special effects, should be embraced and celebrated. Our kicking (3.8 at one point) was enough to keep Sandgate in the contest but it would be a steadying kick from Bones that heralded a change in kicking fortunes for us. The sight of Haema methodically walking Bones through the finer points of set shots as he went back to line up, was a personal highlight for me, though Bones tells me that Haema lost interest half way through the tutorial and just wanted to know what time the canteen opened. A great effort by the olds to overcome some tardy, early season football to steady and run out comfortable winners in the end. There were equally oppressive conditions for the Supers lads in their game, further exacerbated by a chronic lack of water being run on the day, which had most of the boys screaming for water. I say "most" because I'm fairly certain I heard Jarred calling out for gelati instead but I could be wrong. Rest assured that the club is looking into ways of ensuring the boys are suitably hydrated going forward. Whether that's via a campaign of helicopter water bombing or a wet t-shirt competition at half time, I'm not sure but watch this space. The Supers jumped out of the gates with some nice early transitions but whether through the conditions or opposition pressure, Sandgate soon pulled back the advantage and took the lead. The usually reliable kicking boot of Hottie went on sabatical for this game as spectators in both pockets had to be hurriedly ushered to safety behind the goals. Reasons and excuses may vary but my own initial thoughts on the matter were that the issue might be that he appeared to have decided to play this year in his socks. First glimpses proved deceiving however as the socks in question in fact turned out to be what's left of his beloved boots. With most of the stitching in an advanced state of decomposition, said boots are now largely held together via a combination of strategically placed tape and collective prayer. Hottie is now officially the only player at the club who has to have his boots painstakingly removed by Archaeologists. There was much to like about the boy's first up performance though. From several telling marks in defence by the ever improving Chucky to Jar Head (Jarred) providing first use of the ball, or failing that, enough shade to cool the midfielders between ball-ups. Brendan had a mixed outing with the umpires, though few will ever question his intensity. Using one Sandgate player as a toboggan in one clumsy tackle he was subsequently penalised but later offered to go halves in the hiring of a Bobcat to help extricate the player. Only minutes later he once again ran afoul of officialdom for head butting another Sandgate player in the chest, whilst trying to free himself from a tackle. No charges were laid after it was agreed by all that there is no accepted penalty for attempting to wear another player as a hat. Hoops hit the contest with regular vigour and the scoreboard on multiple occasions whilst Skull, putting the earlier disappointment in his choice of shorts behind him, took some impressive grabs on the day. The Shark's Mosquito Fleet showed some exciting glimpses, with Dutchy kicking a nice goal and proudly taking to the skies once more in celebration whilst Caspar ran tirelessly despite his delicate Celtic complexion enduring obvious duress, prompting calls for him to become the first Sharks player to take the field in a burqa. Although the Supers didn't come away with the 4 points first up, it was an altogether pleasing performance that will give the players heart coming into their first home game. Kudos to the likes of Sass, Kingy, Princess, Tank, Pipes and any others I may have missed for putting their bodies through physical torment on the weekend by playing both games. Top stuff boys and a huge shout out to our strapper Michael, who we had to run water to at regular intervals between strapping Wolfie and erecting scaffolding around Haema but never once waivered in his duties, although I did overhear him talking to the good people at Elastoplast, trying to ascertain as to whether they can provide tape that comes on a hose reel. Good luck with that. Go Sharks! Thanks to all our supporters of this event. 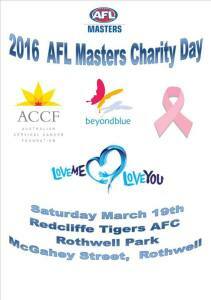 We are very happy to be playing in the 2016 Charity Football Day at Redcliffe AFC on March 19th with our game against Aspley starting at 4:30pm after the Bombers and Redcliffe/Sandgate at 3pm.. 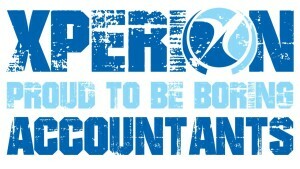 The Souths Sharks are supporting Beyond Blue and we would like to field a strong combined team of 35's & 45's. 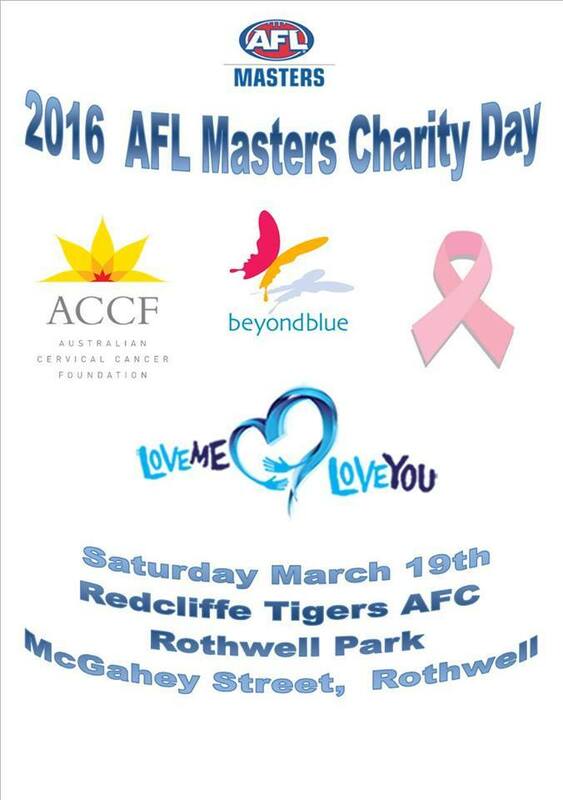 Aspley are supporting Love Me Love You, Redcliffe/Sandgate are supporting Cervical Cancer and the Bayside Bombers are supporting Breast Cancer. These are all very worthy and important charities and everyone of us has been or will be, touched by a loved one, close friend or workmate that has been in need of these charities amazing work and support. 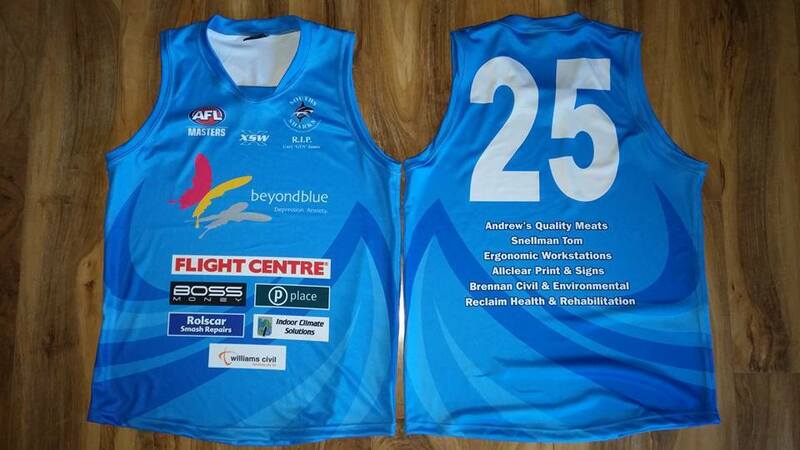 Entry is $45 per player which will also provide you with a special game day Guernsey to keep. 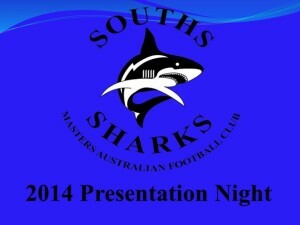 The Souths Sharks night of nights will be held on the 31st October 2015. I what is promising to be a spectacular night, we want to see all Sharks and their partners at this most auspicious occassion. Round 5 saw us send off a chapion of our Club, Robert 'BIC' Schaeffer. Bic has been a chapion for the Sharks for close to 7 years and always played tough, fearless footy, mostly in defence. Bic is a champion bloke and the Souths Sharks will certainly miss him both onfield and off. Good luck mate to you and your family. 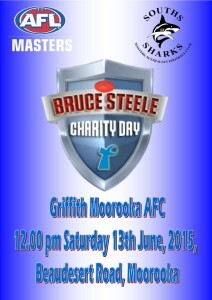 We have a very close connection with Moorooka in our mutual mate, Bruce 'Jack' Steele who is a past player and Coach of the Souths Sharks. The games are not full contact and based on the current 9 a side competition. 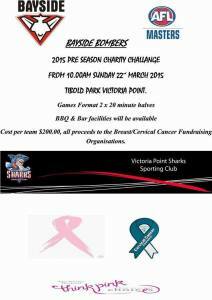 There is a small cost per player of $10 and the Souths Sharks will also match the amount raised. Burger has apparently also been 'baptised' as a Sikh (Burger Singh) in the holy waters surrounding the Golden Temple at Amritsar the most holy place of the Sikhs. The Souths Sharks are very pleased to announce a new Sponsor for 2015. 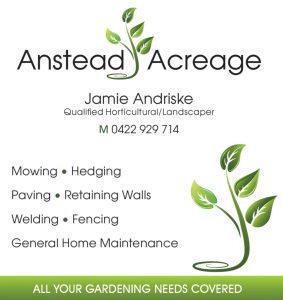 Anstead Acreage, owned by Jamie Andriske, have all your landscaping and home maintenance needs covered. 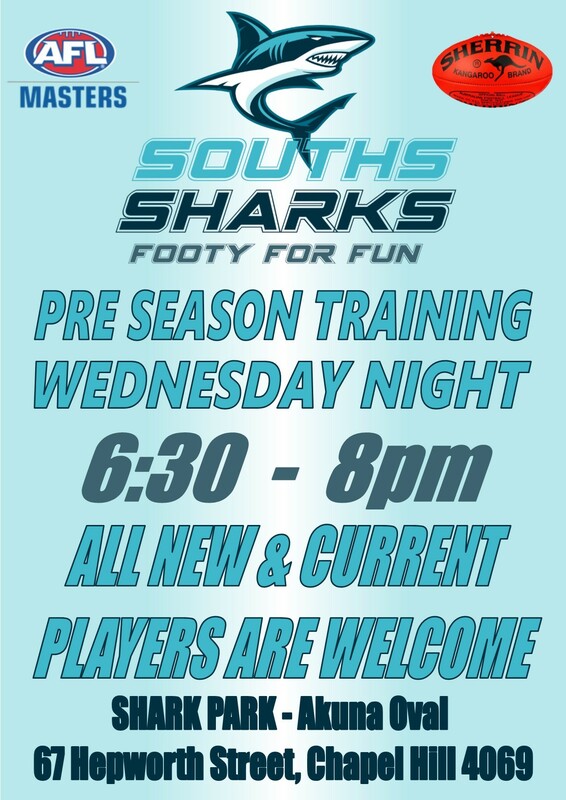 The Souths Sharks 2015 season is off to a great start with close to 40 blokes turining up to training the last 2 weeks. Welcome to all the new boys, it is great to so many new faces at the club and we are sure that you will be around for many years to come. 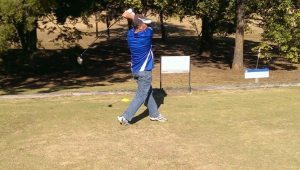 Round 1 is coming up, over 35's on the 11/12 April and the over 45's on the April. We also have the charity bash this Sunday which is a combined Sharks team so we want to see everyone out on the track this Wednesday at 6:30pm. 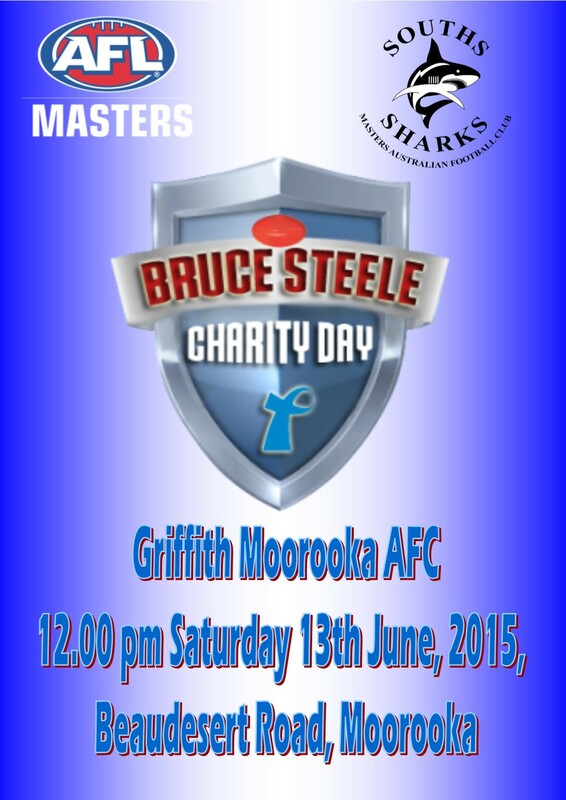 We will be fielding a combined Sharks side comprising players from both the 35's & 45's. The games will be 20 minute halves and the current start time is 10am. Please CLICK HERE if you will be playing as we need to know numbers asap. The Souths Sharks are very proud of our history and our heritage and we like to honour players that have helped shape the club and create a culture that we can hopefully pass on to the new generations of players coming through. Our most prestigious and highest honour is to become a life member. This is not an annual award, it is awarded to a player that has given their service to the club for a minimum of 10 years and who has shown exceptional leadership qualities and simply been a fantastic team mate to all those around him. In 2014, we are very proud to induct Peter 'YATALA' Brennan as a Life Member of the Souths Sharks Masters AFL Club. 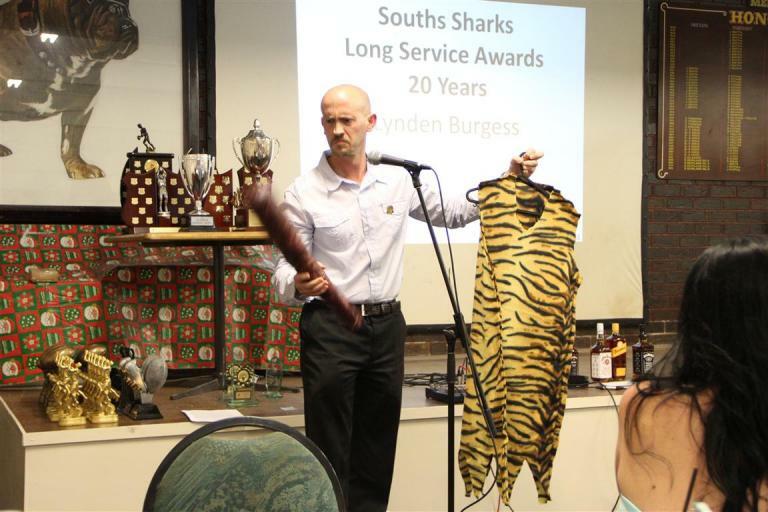 This is the 30 year anniversary of the Souths Sharks and we felt that this prestigious night deserved a bit more glitz and glam and the new location for this years awards night, the Sherwood Services Club, certainly provided that. The entertainment on the night was brilliant and everyone looked fantastic. There were some very desrving award recipients along with a couple of surprises! 2014 has really been a fantastic year for the Sharks. We had a minor shuffling of the Committee and were strengthened with some new members with some great new ideas. Ideas designed to bring us together more outside of footy and also raising some much needed cash for the Club along the way. The Mothers Day barefoot bowls and Sharks Golf Day were great events and Croc and the newly formed Social Committee did an amazing amount of hard work throughout the year and I know we are all looking forward to next years events which I am sure will be even more successful. 2014 really was a big year. We welcomed many new faces to the club, which is vital for our future so don’t stop asking your mates or workmates to come out for a run. We introduced our new playing strip, going back to our previous colours of Blue & white after 5 great seasons in the blue, blue and grey. 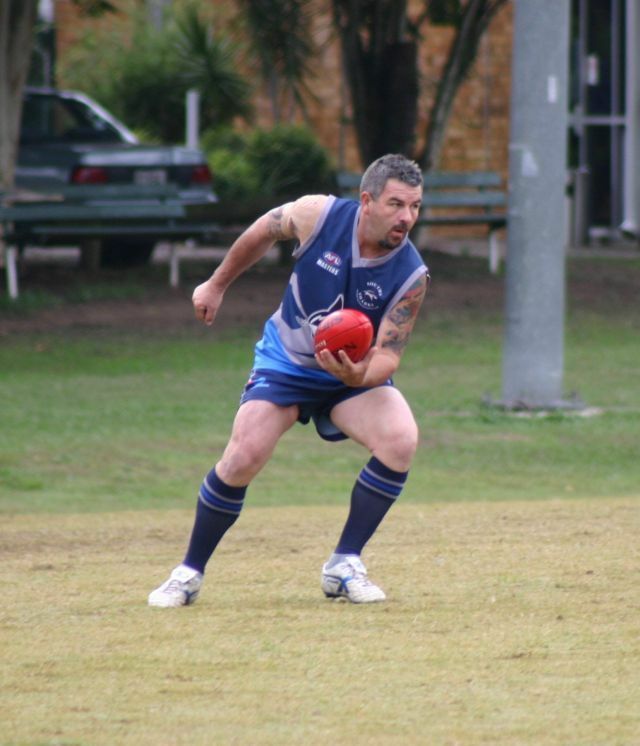 We also had to adapt to the new age groups of Masters footy. Supers changing from over 33’s to over 35’s and the masters from over 38’s to over 45’s. This saw a bit of a reshuffle of the playing group with some Masters having to go back to the Supers. We were also very lucky this year to appoint of two new coaches. 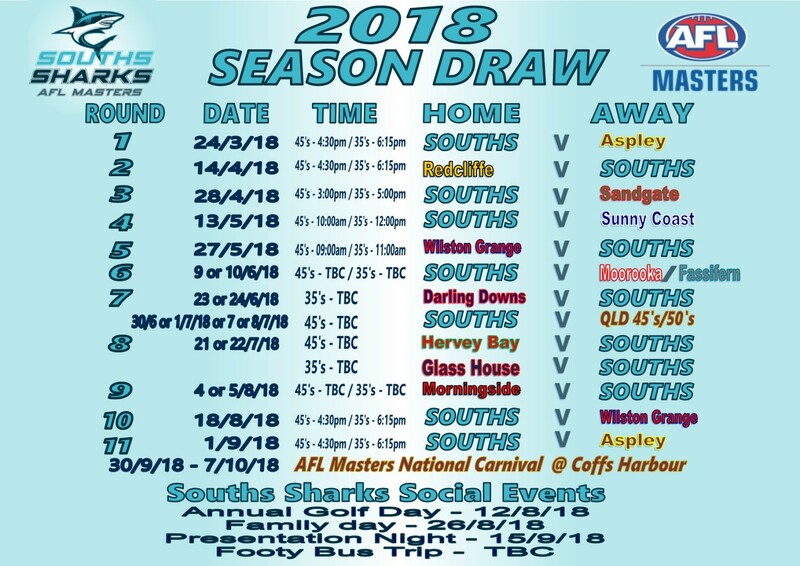 Sparksy did a fantastic job this year, guiding the Masters to 11 straight wins with only 2 losses, one of which was to Hotty’s Supers in the Inaugural Grudge match. A big thankyou to the entire committee, we have made some big decisions over the last year and every one of those decisions were thought through carefully and discussed openly. We look forward to the coming season and welcoming some new faces to the Committee. There are a couple of players stepping down from their roles on the Committee and they desrve a massive thankyou from every Sharks player for their dedication and passion to the Souths Sharks. Matt 'CHIEF' Clanchy has been our Delegate & Registrar for over 4 years now however whenever there was something that needed to be done, Chief would take on the role and get it done. Great work Chief! Daniel 'CROC' Ivinson headed up the newly formed Social Committee and has laid the foundations for the coming years ahead. Well done Croc! So well done to everyone, it has certainly been a fantastic year at the Sharks and I know that 2015 is going to be stronger and importantly, more fun for all of us. 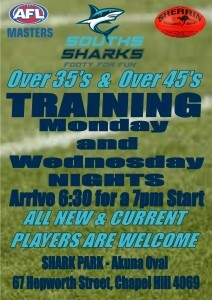 Well done to all the Sharks that turned up for our last training run last night. Hotty & Sparksy have done a fantastic job coaching us this year and our results on the field are testiment to their hard work and dedication to that. 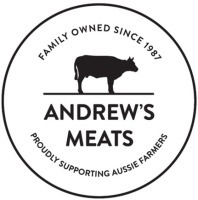 Thanks, again to Mousey for getting the tongs out and manning the BBQ, with some special snags from Andrews Quality Meats at Mt Ommaney. The Rindfleisch, Poulet and Smokey Swine were delicious and cooked to perfection. We all want to finish the 2014 season on winning note so lets see all available players out at the game on Sunday. 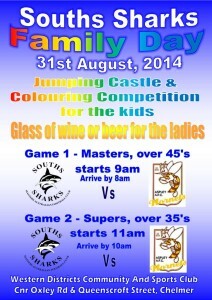 Remember, it is our annual Family Day so bring the kids and wives along for a day of fun. 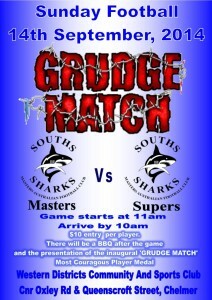 The Inaugural Masters v Supers game is on! Lets see every Shark out there to support your team and help raise some money for a very worthy cause! This Sunday is our last official game of the season and our Family Day! 2014 has been a great year for the Mighty Souths Sharks and we want to say a small thank you to all the wives and kids for putting up with a long season of footy and looking after us with all of our injuries, aches and pains. We will have a jumping castle to keep the kids busy along with a colouring in competition. Fot the ladies we have a complimentary glass of wine, beer, soft drink, tea or coffee. So lets see everyone out at training and at the game. 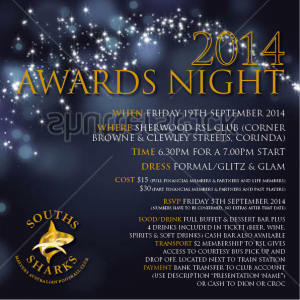 The Presentation night is locked in for Friday 19th Sept, at Sherwood RSL. This will be a formal event this year with full buffet and dessert bar (menu at bottom of email) and entertainment. There is a cost of $15 per person (full financial players & partners and life members) and $30 per person (part financial players & partners and past players). With each ticket you will receive 4 free drinks (beer, wine, spirits or soft drinks), and then there is a cash bar with the RSL having some of the cheapest drink prices in the Southside. Sherwood RSL also has a free courtesy bus for members ($2 for year membership) which collects from the suburbs listed at the bottom of this email. Members also have access to the snooker room next to our room with 3 full sized tables. Go on the Sherwood RSL website to sign up (www.sherwoodservicesclub.com.au). 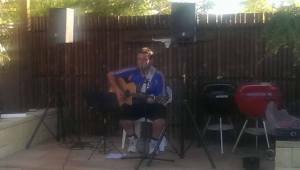 The club is open till 1am with live entertainment on downstairs after we have finished for those who want to carry on. If you have any questions or are attending but need a vegetarian meal organised, please email me directly. The Jindalee Jags held an awards night/fundraiser for Chloe Sells (Sharks player Corey "Cuddles" Sells daughter) last weekend, where they raised very close to $5,000 for the family who have been a little blown away and are very appreciative of everyone’s kind thoughts, words and donations. For those of you that would like to continue your support, Cuddles and his family at this time; Rachel Strong from the Jindalee Jags will be convening a “Cookies and Cakes” stall at the Jags ground on Saturday 2nd and Sunday 3rd August. Please let Rachel know if you are able to bake or if you would like to donate ingredients, Rachel can be contacted by email on send2rach@hotmail.com or mobile 0402593942. 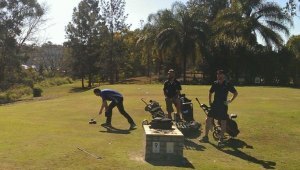 Perfect weather, great mates, lots of laughs and some pretty good golf. Thanks to everyone who participated in what will definitely be a permanent fixture on the Sharks calender and a big thanks to the social club for organising a great event. Congrats goes to Ezy & Warwick for taking out the prize for best on the day and to Burger & Kerrie for not. Well done and thankyou to Sparksy and Sharon for opening up the batcave and putting on a fantastic feed for everyone that could come back. Check out some of the action on the day with some clearly showing a bit of style. Get your teams together boys and support the club and have a cracker of a time doing it. Already have 3 teams confirmed so only 17 spots (teams of 2) left. If you want to play but don’t have a mate to play with, just see me and I’ll try and organise the single entries into teams. Out we came, out we came, out we came to play! 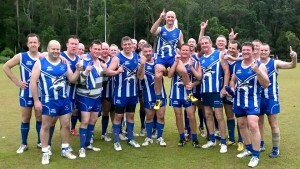 Congratulations to both the Souths Sharks over 35's & over 45's for winning 2 hard games of footy at home today. 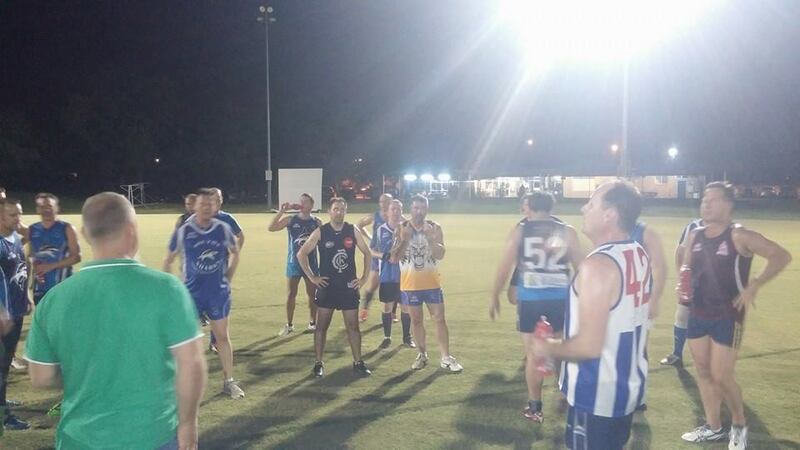 The 45's were up first against a Coolangatta side that gave us everything they had for 4 quarters. They didn't count on our boys having stand out performances across the ground, which resulted in a gutsy and well deserved 13 point win. 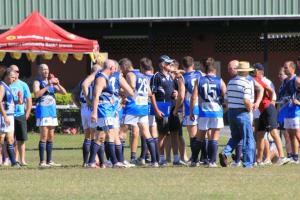 The 35's took on last years form side of the competition, Palm Beach, and it was good hard footy from the first bounce. Vern came out and had an absolute cracking game, the best he's played, and was rewarded with lots of the ball and 3 nice goals. We also had Dutchy back for his first game of the season and Danny returned after his first game head clash with a second game head clash, evening up the face with a cut to his other eyebrow. He was able to return to the field and had a great game. Thanks to our 2 Super Coaches, Sparksy & Hotty for getting us up and over the line, our first aid /physio of the day Suth who did a fantastic job, everyone that assisted both on and off the field and to our umpires of the day, Pipes, Croc & Gerrard. 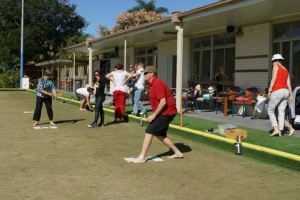 Thanks to Croc, Simmo and Dion for organising an enjoyable Breakfast and Barefoot Bowls day, today at Oxley Bowls Club. The guys couldn't have picked a more beautiful morning for a sumptuous breakfast followed by a competitive game of lawn bowls. The Sharks players and their families feasted on croissants, sausages, scrambled eggs, toast, fresh fruit and juice with plenty of tea and coffee to go around for all - there was even a few cold beers for those who like to wash down their breakfast with their favourite brew! The ladies were treated to champagne and each one was given a fresh tulip for mother's day. Well done everyone for a great morning - we look forward to the next Sharks Social event! Over the past few months our community has come together for a very special girl. We have outbid each other in many auctions, pushed ourselves to the limit in bootcamps, and many different events held by family and friends as we watched Chloe progress in overcoming this illness. 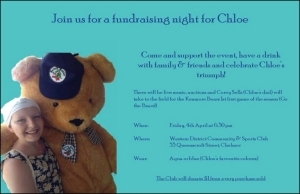 This is a chance for all family and friends to get together for a night of fun, footy, drinks and to pay tribute to Chloe as she embarks on final stages of her treatment. There will be a game of football on with the Kenmore 3rds, starring Chloe's dad Cuddles taking on the Woodsmen at 7:30pm. 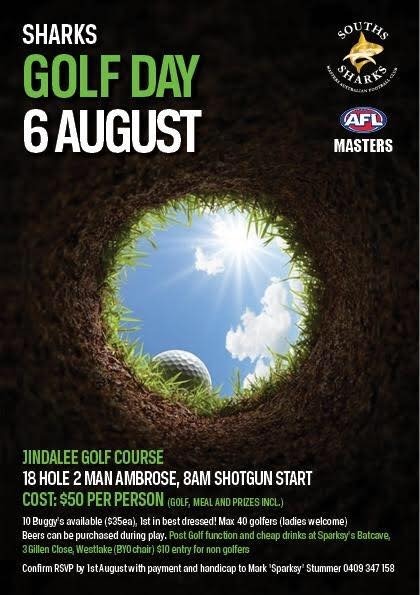 There will also be live music, some last auctions, hopefully some fun for the kids, and the Kenmore Club will be donating $1 from every drink sold. 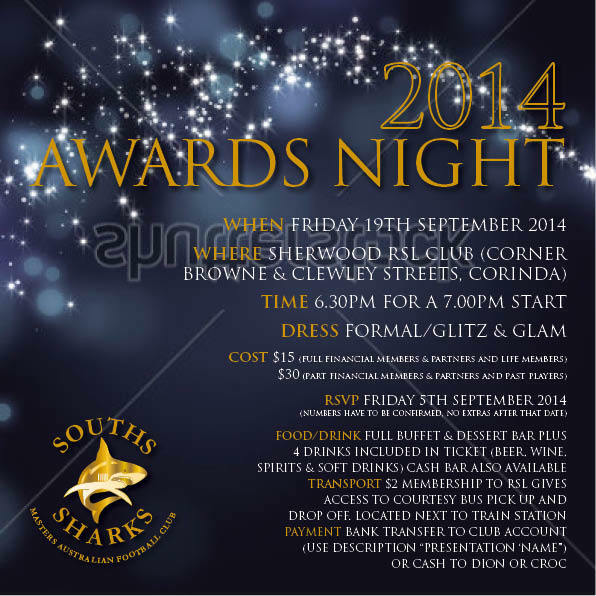 It would be great if we could get as many Sharks people as possible to come and support the night. Everyone attending is requested to wear blue or aqua as this is Choloe's favourite colour. Please invite your family and friends, everyone is welcome. 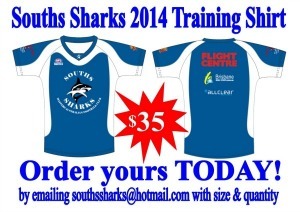 You must order and pay for your Sharks Training T-shirt now. Send an email to southssharks@hotmail.com with your size and quantity. Time is running out. 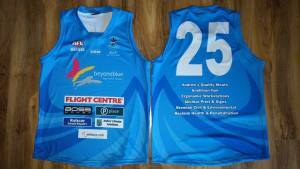 Sharks welcome Flight Centre (major sponsor) and The Vet Shed on board for the 2014 season and beyond. 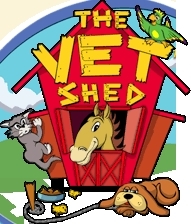 Thanks to Campo for helping out with Flight Centre and Cam (coach) for The Vet Shed. As a result we are able to purchase new Jerseys for 2014 aswell as shorts and socks. Please support the businesses that support us. Without their contibutions fees go up. See 'Our sponsors' page for more details. 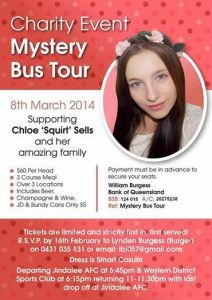 You may or may not know that, Corey (Cuddles) Sells (Sharks Life Member) 13 year old daughter Chloe has been diagnosed with a lymphoma (ALK Positive Anaplastic Large Cell Lymphpma). It is a very aggressive type, but one of the most treatable. In saying this, it is still a long process for Chloe and her family. Corey has said that Chloe is being so strong and positive. Corey played Thirds last season with the Kenmore Bears and has also done a lot with junior footy over the years. 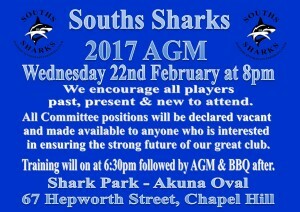 He has also played many years with Sharks and is a Sharks Life Member. 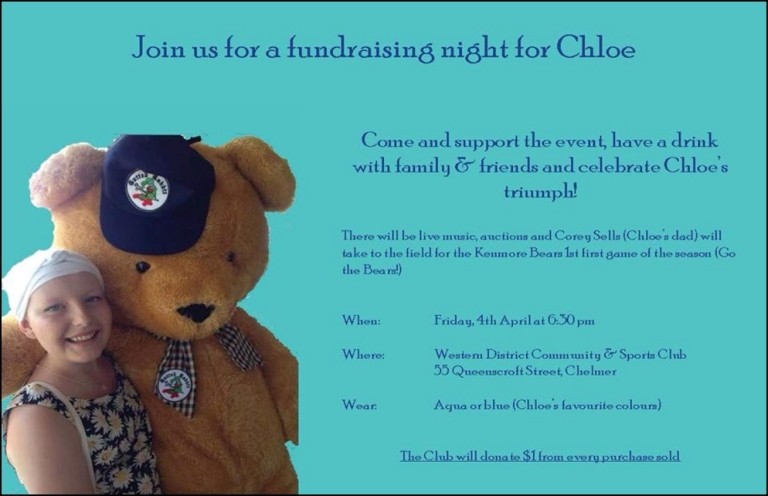 The Kenmore Thirds coach (Mark Gilbert) has set up a Facebook event, the "Chloe (Squirt) Sells Fundraising Event". What he is trying to do here is start some fundraising events and auction off some weekly items, and then late Feb/ early March hold a fundraising day and try and have an Allstar Footy match, all in the aid of Chloe. We ask that you all get behind this event, please add as many of your friends to the Facebook event as you can, and help put a smile on a young girl's face. If you can get a hold of any auction items, they would be greatly appreciated. Mark is hoping to have the first auction up for grabs starting the week of the 1st of December. Well the crowd gathered on the red carpet as the players and their guests arrived in their limousines to the biggest gala event of 2013, known as the Souths Sharks Presentation Night. The paparazzi (Mrs Jenko) were out in force on the red carpet to get a glimpse of what the WAGS were wearing. They will feature in The Sunday Mail’s U Magazine next weekend. This night is a great opportunity for the players to show how drunk they can get. The night commenced with an appreciation of Sharks Sponsors and helpers throughout the year, which included Bert (First Aid) and Bob (Umpiring), both couldn’t be with us tonight and Mrs Jenko for taken the awesome photos you see on the Facebook page and website. Although they are mostly of Jenko, when he is playing of course. This was followed by various player awards given out during the night. 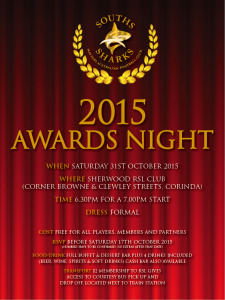 All the winners have been uploaded to the Sharks Website under 'More Menus' 'Honour Role & History', but the major award winners, the Best and Fairest Awards were won by Chris ‘Big Chris’ Grocoe (Supers) and Jamie ‘Muttly’ Andriske (Masters), unfortunately they had previous commitments and couldn’t attend the night, well deserved guys, you both had a great year. It was also fantastic to see Peter ‘The Poet – (the player formerly known as Yatala)’ Brennan take home the Masters Players Player of the Year Award. This award is won by the player voted by Sharks players to be judged the player of the year. You are a worthy winner Poet and it is a pleasure to play with such a top bloke!!! Corey ‘Cuddles’ Sells was inducted as a Souths Sharks Life Member for recognition of the work he has done for the club since joining in 2003 including President from 2008-2011. Well done Cuddles, you are a true champion and have certainly contributed immensely to how strong the Sharks are in the competition today. There was a huge amount of laughter and frivolity going on all night with lots of food eaten and alcohol consumed. 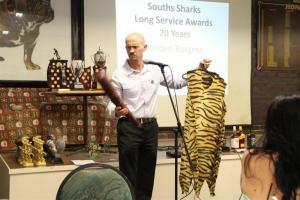 The Sharks Academy Awards were a big hit with Haema being nominated for a number of awards, of which he received two. The Perfect Partners was a cracker with 3 players ambushed on the night thanks to Haema and their partners. Up were, Spinky (the player formerly known as Pipes, The Poet (the player formerly known as Yatala) and Jenko (the knick name his wife calls him wasn’t worth changing his current knick name – well according to the author of this anyway (Jenko)). There was also a visual presentation of what the Sharks players have been up too in the offseason. Learning Korean, Tribute to Fruit, Old Man Rapping, Hawaiian hula dancing and the Chippendales made an appearance. This was a crowd pleaser and featured some well known Sharks Stars. 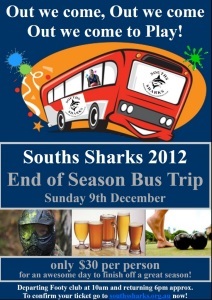 These have been uploaded to the Sharks Facebook page for all to see. Chief highlighted that since he didn't receive any B&F votes that there should be a new award for the Masters Player who consistently doesn't receive any votes so he can at least receive an award. Perhaps next year Chief! Plus a little sibling rivalry between Chris and Jimmy Garrard. Chris received 2 awards and Jimmy missed out. Jimmy reckons there should be a mark of the year award so he can also receive an award. But Jimmy, even though the mark was paid by the umpire, you can’t use your knees to slam into the back of a player, the committee needs to play by the rules! The spectacular night ended with a performance by Tina Turner (Crocs girlfriend Fi) and her backup dancers. Wow, what a performance this was. The dance floor was soon full of dancers and at one stage there was Sparksy and a bunch of chicks doing the nut bush city limits. I remember that dance from school. Thanks Fi and Croc. The food was fantastic, so thanks to Sheryl and Wests. Thanks for everyone who helped out leading up to and on the night. See you all when we commence training in January 2014. 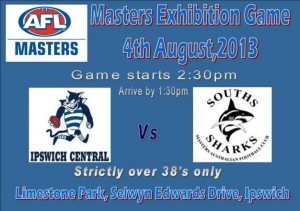 This is a game to showcase Masters AFL Footy for 38+ players. 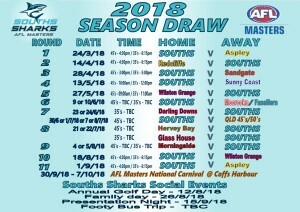 The game will be held at the Ipswich Cats Home ground at Whyte Family Clubhouse, Mark Marsh Oval in Limestone Park, Selwyn Edwards Drive (off Lion Street), Ipswich (enter off Salisbury Road). 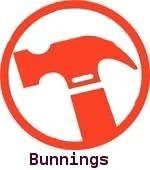 2013 Bunnings BBQ - Sign Up Now! 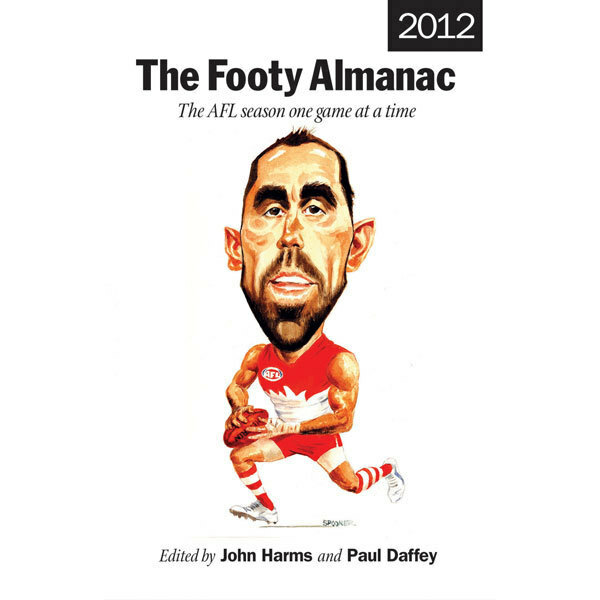 The Almanac commissions two writers for each game of the normal home and away AFL season to ensure both clubs are represented in our coverage. These reports are then posted on the Alamanac's website. Game reports can be submitted from everybody else (whether supporters of the participating clubs or neutrals) and then posted on the site for all to enjoy. One report is then chosen for the Footy Almanac for that Season – a decision that is judged, among other things, on the story itself (of course), reader response, the winning side, the moment in the season etc. Well done fellas for your work and dedication in sharing your often humorous views on a watching an AFL match. Take a punt at old masters!!! 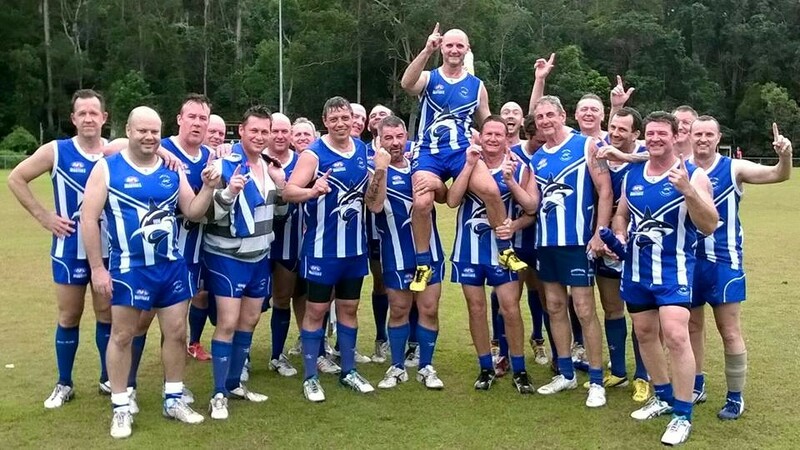 AUSTRALIAN RULES: Blokes who think they are over the hill can take a mark and have a kick with AFL Masters Queensland looking to bolster its ranks. Picture: ADAM ARMSTRONG STILL KICKING: Paul Newbury, Scott Edwards and Matthew Goode are players in the AFL Masters, with the competition looking to boost their profile with night fixtures at Chelmer. 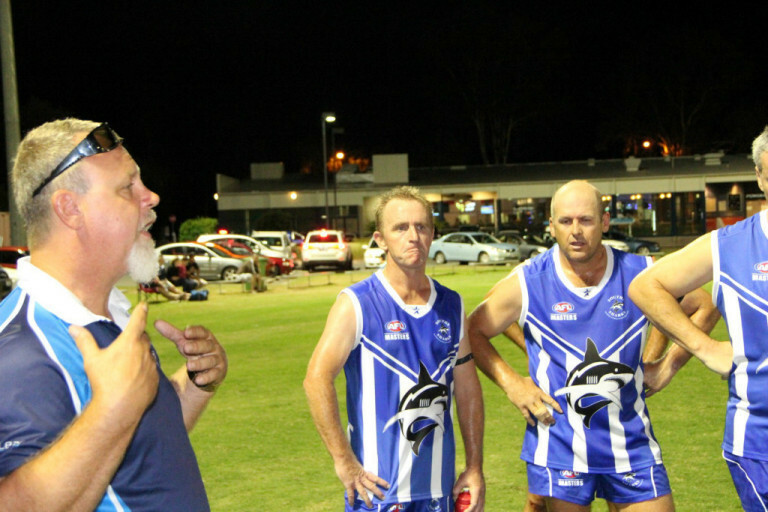 The Souths Sharks Masters AFC are hosting night fixtures on Saturday at Sherwood Districts AFL club for families, former players and amateurs alike to see the competition in action. 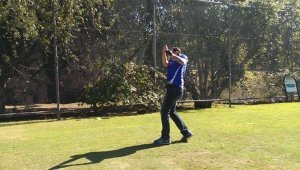 There is a Supers division catering for players over the age of 33 and a Masters division for players aged 38 and older. 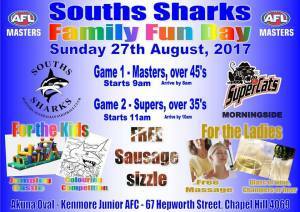 Sharks vice-captain and Masters committee member Matthew Goode said it was footy for fun and nobody was too old to play. ‘‘We get a lot of guys who turn up who have not played since they were teenagers and they come down and find they’ve still got some skill,’’ he said. ‘‘Then there’s the family side of things where the wives come along and the kids are there supporting their dads. ‘‘Masters is Australia-wide, but a lot of people don’t know that people in their 30s and above can play. We’ve got players as old as 50 in the Masters. A great, albeit, hot day today for the pre-season "Be a Man Carnival" at Sandgate. The afternoon consisted of 2 games with 2 x 15minute halves against Wilston Grange first up and then Kedron. All Sharkies boys had a real red hot go in red hot conditions with a win against Kedron and a fighting loss to Wilston Grange. Thanks to everyone who also turned up and supported in various roles; Aga, Mousey, Zulu, Vern, Robbie, Chris and Troy - great effort guys! 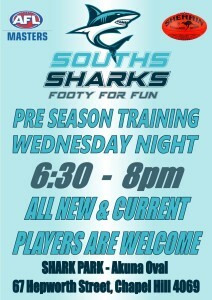 There are 2 pre season carnivals that Souths Sharks have been invited to submit teams. It will be a combined supers/masters team for each carnival and we will only be nominating to attend the Sandgate Carnival. Sandgate - 23 March 2013 - Sandgate AFL Club - Raising funds for Qld Prostate Cancer Council and the fees/donations are $5 per player. Can everyone please click HERE to respond if you can or can’t playing at either or both of these carnivals so that we can get an idea of numbers! 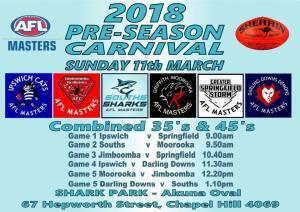 You MUST be registered as a player and paid with Sharks and Masters AFL Qld to play in these carnivals. If you are not registered, you will not be allowed to run on. Wednesday night training off to a cracking start!!!! The first training night for Wednesday 6th February 2013 started with a good turn up of both new and old members. Great to see. Poor new guy Aga had to go to hospital to have his finger put back in but he is ok and will be back on the paddock next week... good on you Aga!!!! The night is free for all fully financial playing members, which includes drinks, except for pre-mix spirits - which will be a cost of $2 payable at the bar when ordering. Child Minding will be setup in the Dressing Room, where we will have a TV/DVD. Bridgette will be looking after the kids! We ask that you have the kids fed and that they bring any snacks or requirements with them. Please ensure that the have a sleeping bag/blanket/pillow, plus any books or games they might want to use. 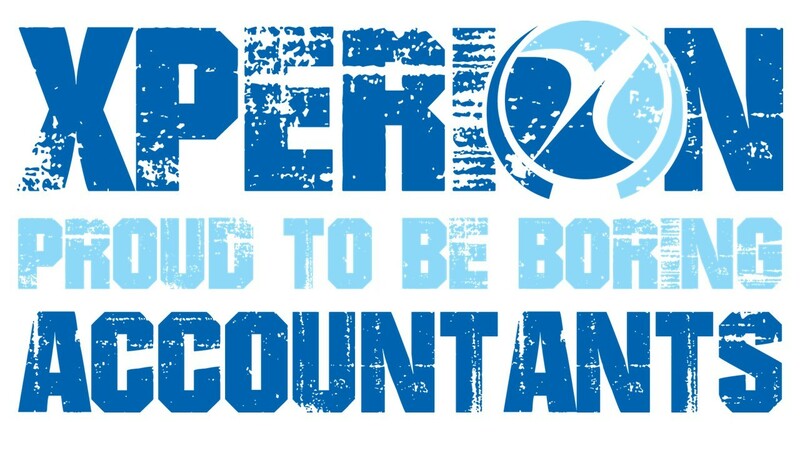 Dress Code is Smart Casual - no need to wear your Sharks Polo! Jai x 1 (19/8) PAID! Important End of Year - To Do List!! To help with the running of the club, you DO NOT need to be on the committee, but the more hands the easier everything is. 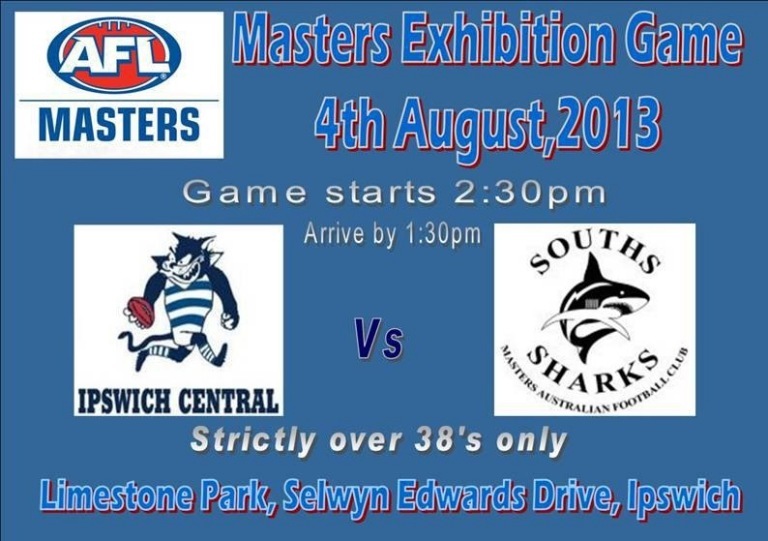 Next year may see some changes in when games are played, including the possibility that Supers and Masters may not play at the same location on the same day, so if you would be willing to help out with some of these jobs, especially some of the game day duties, please go to the online form: Souths Sharks 2013 Club Management and nominate either for the committee, or to assist in Game Day Duties. When you go to the home page at the moment, you will see that it is different - when we aren't training or playing, we will have this new page which encourages new recruits - we have already had a number of enquiries and applications for new players in 2013 - to go to our regular page, just click on the big blue text! 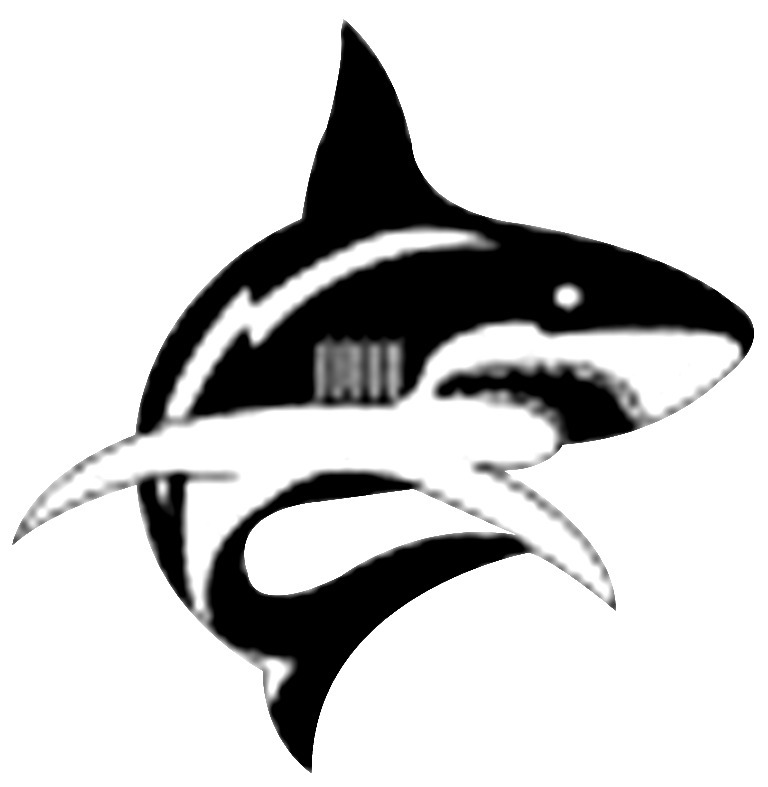 If you are interested in putting up your hand to coach either or both teams in 2013 - please reply email me back at southssharks@hotmail.com . Each year we take the opportunity to ask our members if this is something that interests them - so don't think this is anything against Ant or Al!! End of Year - What's Planned! Here you will find all the information and links to RSVP for the various end of year activities! 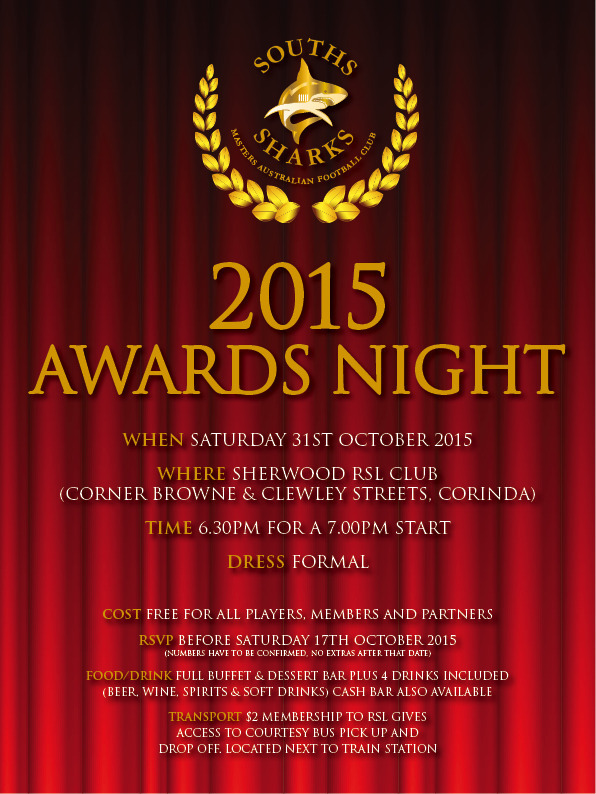 RSVP for the presentation night here! A night of fun for all playing members and their partners with games, Brownlow Style B&F Count and all the awards and joviality that comes from a group of beered up Footy Players! NOTE: We are planning on organising some accredited Child Minding for the night (bsed in the dressing rooms), so if you would like to available yourself of them, please indicate on the RSVP Form how many children you have and what ages they are. 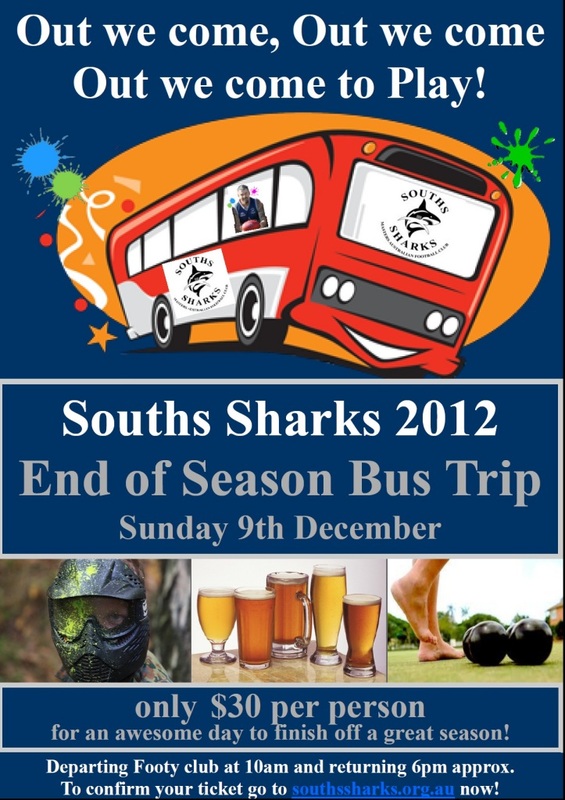 RSVP for the End of Year Bus Trip here! The club is covering the cost of a bus to have a day of fun with paint ball, great meals, activities, and barefoot bowls. Just $30 to put towards the cost of the activities. Players and Support Staff only! 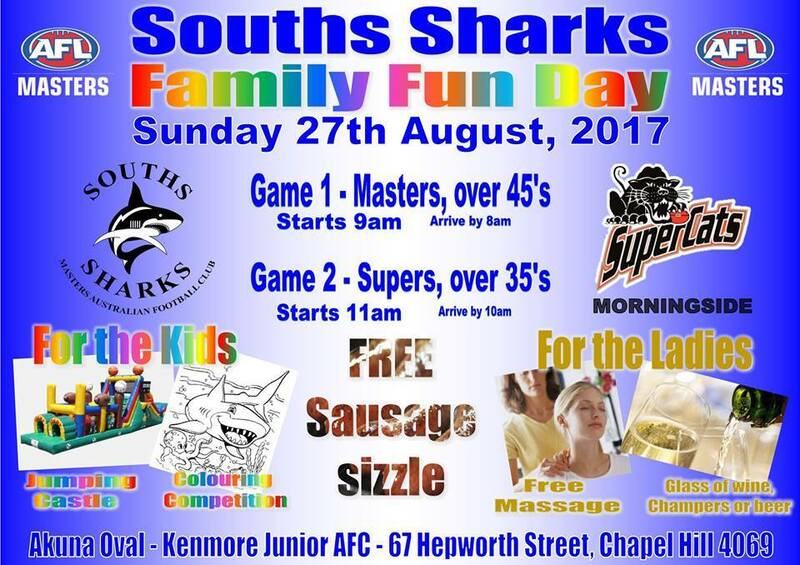 Kenmore Bears and Souths Sharks are hosting a Sportsman's Night on Tuesday 14th of August from 7pm to raise money for the clubs. We have exceeded all expectations, and are expecting between 90 & 100 people! If you are planning to go, please make sure you register for your tickets here Reserve your tickets here, NOW! If you haven't paid for your tickets as yet, you can do so on the night at the front door! More Substantial Food will be available from the Bistro! Thank you to everyone who supported our raffle, with tickets spread well across our team mates, family, friends and work colleagues. 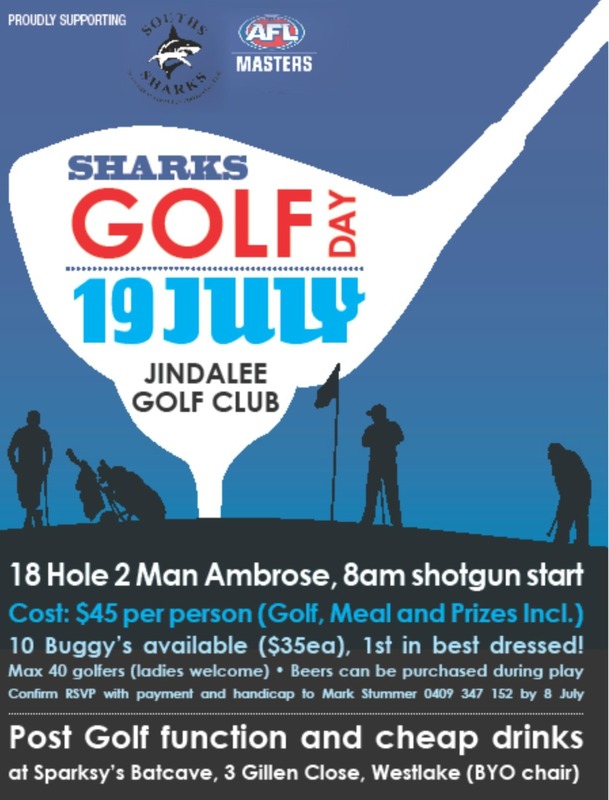 Ticket Number 03873 - Scott Jenkin "Jenko"
Ticket Number 06276 - Bill Ellis "Billy"
Ticket Number 00758 - Paul Murphy "Murf"
Ticket Number 02358 - Peter May "Pierre"
Western Districts along with Souths Sharks and Kenmore Bears are offering a meal post-training on one Tuesday a month. Meals will be $10 per head, and everyone is welcome! We need about 20 people per night for it to be financially viable - but of course, everyone is welcome to stay for a beer or other beverage! The club's recovery post-floods has been slow, and now with a new kitchen, time has come for everyone to support the club to get things back up and running to better than pre-flood levels. 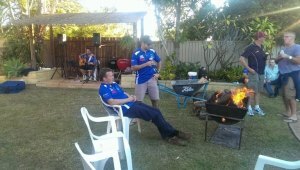 The Souths MAFL Club will hold a sausage sizzle on the other Tuesdays, and all are welcome to have a sausage and a beer on those nights too! Souths will also run a raffle on Meal Nights. Use the link below to RSVP if you would like a $10 meal after trainingon the 3rd July. If you do RSVP, please make sure you pay and collect your meal - otherwise it defeats the whole purpose, and this option might not be viable for Wests. 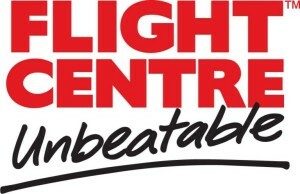 National Carnival Nominations NOW OPEN! All the details on dates etc can also be found here. 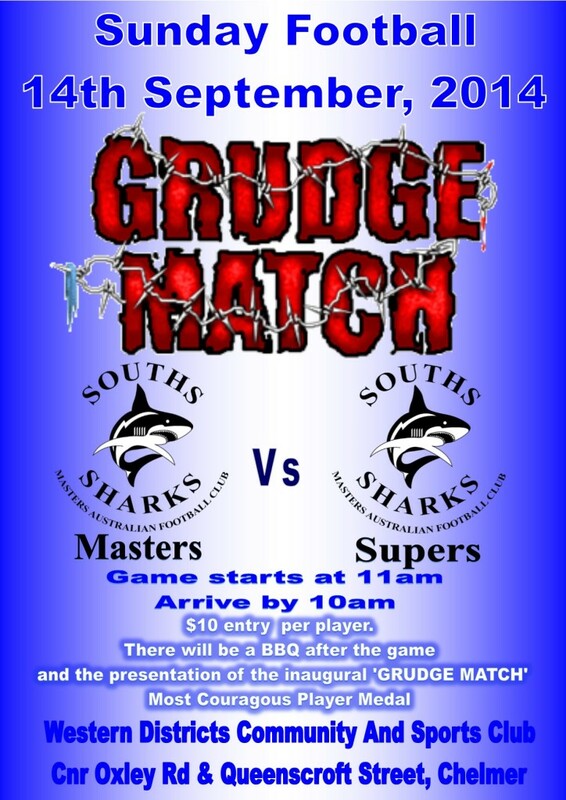 Please be advised that Souths Sharks Personal Injury Insurance DOES NOT apply to representative games. Details for the Pan Pacific Masters Games are now available. Competitions for both 18 a side and AFL 9's are planned. See info below for more details on dates and costs. Anyone interested in Indoor rowing - have a chat to BC about maybe putting a team together. Through Foxy Promotions, we are offering our players, family and supporters the chance to order some wonderful gear. All orders must be received, with payment, by Tuesday May 15th. Please use the forms below to make your orders and return the form and payment to BC at training or the next match on the 13th May. Sorry - to allow time for production and delivery, we cannot extend the order period. All orders will be available for collection at Training, or at games once manufacture haas been completed. Foxy Promotions are responsible for all orders, as we are just a middle man, so any further product enquiries, should be directed to Ann at sales@foxypromotions.com.au or phone Ann on 3818 6411. Ann can do custom orders for you of just about anything, so if we are not offering something, please give her a call to see what is possible! Our jerseys are numbered in accordance with their actual size, so while we do attempt to accomodate people's requested, we are limited. The 2012 Game Day Sign On Sheet is attached so you can check your jersey number. 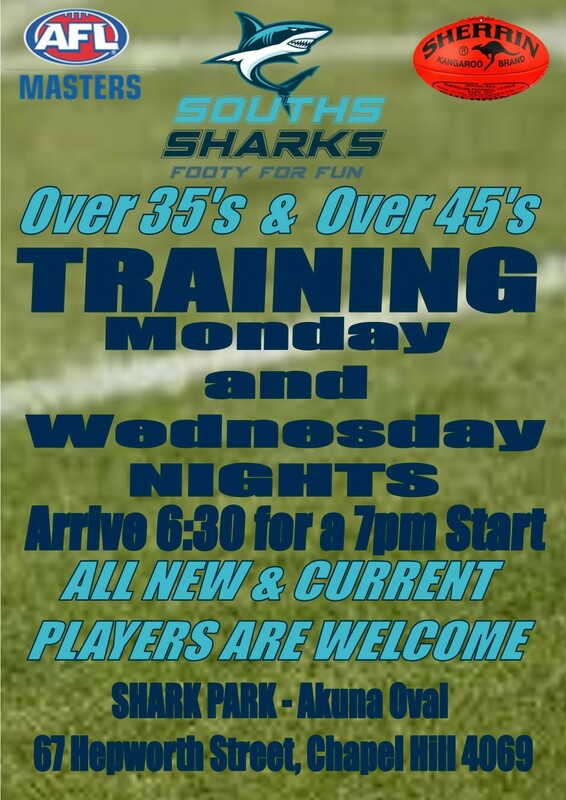 This Week at the Sharks! Key Information for your urgent action! 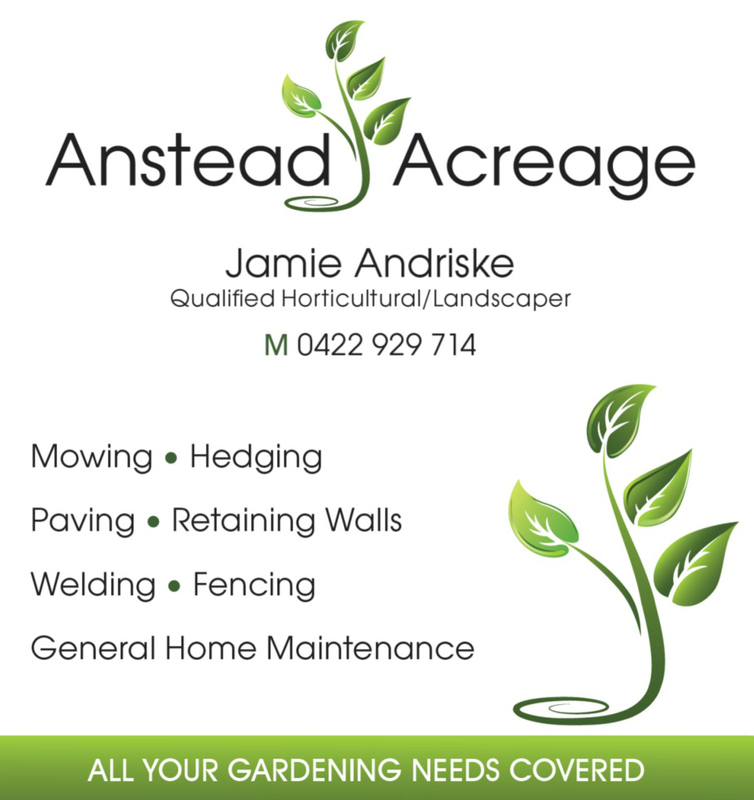 Don't forget we are having a working bee this Sunday at the ground (Rain or Shine) to patch the field with some turf. If you can come, please arrive at 8am with spades, shovels, mattocks and wheelbarrows. We will have a sausage sizzle and some beers afterwards! 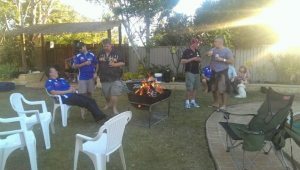 Next TUESDAY, after training - we will have a Sausage Sizzle at the club, so please hang around for some beers! GOLD COAST Mini-Carnival - There are plans for a mini carnival on Saturday 17th March (St Patrick's Day) at either Labrador or Southport. 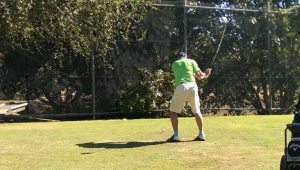 We would put forward 1 mixed team of Supers and Masters to have a few matches (15 minute quarters) , a few beers, and a great time! If you can make it, please use this link to let us know! 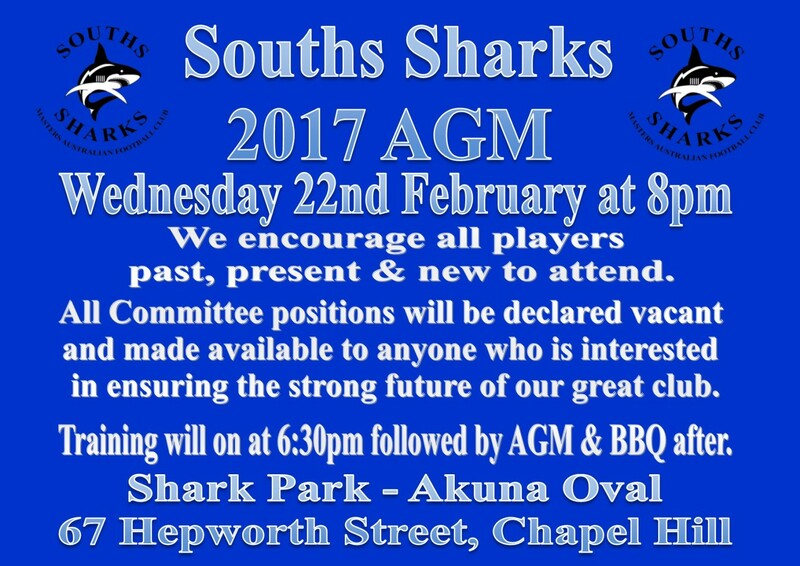 SHARKS MEMBERSHIP - Please use the links on the website to complete your membership application NOW. We need to have everyone who is planning on playing this year all sorted over the next week. We can't issue you with gear, or allow you to play any games unless you have completed this application. Don't forget to read the Code of Conduct first! Masters AFL Qld Registration - Please do this at the same time as your Sharks Membership. You are not allowed to play any games (pre-season or otherwise) unless you complete this! SHARKS TIPPING COMPETITION - Attached is a pdf file for all the instructions - so please take a little time to join for some season long fun, and the chance to win some cash! This survey will take about 5 - 10minutes, and will allow us to prepare a player profile that we can share it with the team via the website. The profiles will get posted with a photo (of our choice). We ask that all existing players complete their info ASAP so that the new guys can get to know a bit about all the other Old Fellas in the team. Life Members aren't exempt - you guys will be first! If you don't fill out the survey, we might end up filling it out for you, so don't delay! 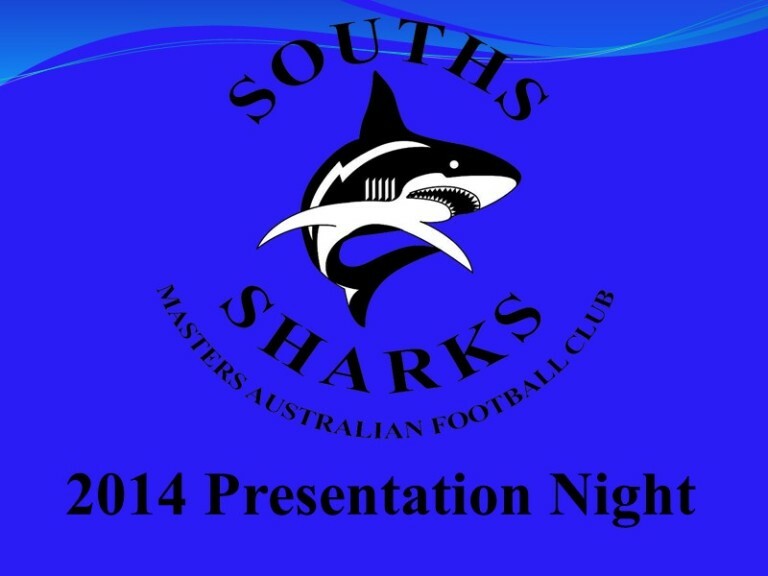 For those who couldn't make it, you missed another classic Sharks Presentation Night. The photos are in the gallery now, but they do not do justice to the many jokes, faux pars and down right alcohol driven comments that kept everyone in stickes throughout the night. The award recipients are also updated on the webiste in the Honour Role! Far to many to mention, but some are impossible not to post here! Teddy doing "Perfect Partners" was asked what his pet name "TT" stood for. Whilst he was procrastinating, Haema piped up with "Titanic Testicles, but they have sunk"
Cuddles doing his final speech of the night, and well onto his upteenth drink - well lets just say that he is no long in the running for the PPP (Positive Presidenting Program) Award! Cuddles - You other speeches were GOLD! The club bestowed two Life Memberships this year, on past members who clearly needed to be recognised. Mick & Jenny Seaton were instrumental in ensuring the survival of Souths for many years, and both have also been recognised by MAFLQ for their service to the club and to the league. Congratulation Mick & Jenny! Igor had great pelase in giving a Roast of both Big Al and Burger, which kept us all in stitches, even though he truly took 6 hours to make a papier mache caveman club, though the playing strip for Big Al (pictured) came straight from his wardrobe! Roasts are now available in "Igors Facts, Figures & Fables"! Igor also took great pleasure in Roasting our outgoing President, Cuddles, which at the end of the night, rounded off another awesome night of team bonding. Amanda held in a headlock by Sass saying - "Your hair smells sooooo good!" whislt sniffing uncontrolably, has left her scared for life! If you missed the night, don't miss next year's!! Thanks for the memories - Al & Burger! 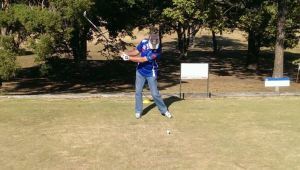 The final matches of the 2011 season were held on Sunday 4th September against Wilston Grange at Gaythorne. 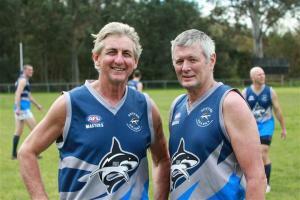 The Masters team farewelled "Big Al" Alex McRae and "Burger" Lynden Burgess after 26 & 20 years in the club respectively. A copy of the article as printed in the South-West news can be found below! The fired up Masters took it to Wilston Grange, who had been languishing all year with a less than impressive record, though the wise South's boys knew that they would be dangerous, and they were! Souths found themselves down a goal after the first quarter, though the breeze had picked up to be a force 6 gale! Kicking with the wind in the second quarter, Souths Showed what advantage should be made of the breeze, outscoring WG 4 goals to 1. BC's opponent for the second quarter was extracted from the soil with a backend loader after being pounded into the ground after failing to take a simple mark. The same opponent thought he might take a running go at BC later in the quarter, and without BC batting an eyelid, found himself bouncing about 6 metres in the opposite direction. BC later gave away a 50 metre penalty in an uncharacteristic show of aggression! Tut Tut BC!! The team was on fire, and continued to outscore, and outrun Wilston Grange, and to finish the best season in ten years, to farewell Al and Burger in style. A superb game from many players, including Pierre, Jenko, Yatala Pete, Mary, Spresser, Ado (who barely could hold onto the ball all day!) and not to mention the old boys Burger and Big Al taking all the ruck duties! 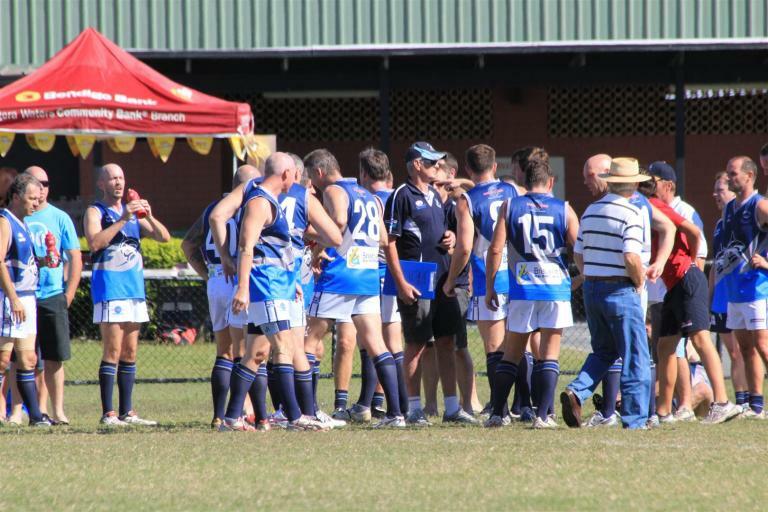 Wilston Grange Supers were before today labelled the best Brisbane side, losing only 1 match out of 11, but the boys from Souths were not going to let that label intimidate them. The breeze was still blowing from the earlier match, which provided some assistance, but it was clear that the ball was not going to spend too much time in the sky, as it was in the aim of both sides. Mumfy played hard against his opponent, causing a number of concentration lapses, and allowing Souths to be up by 5 points at the first change. Now the Souths boys showed why they were a real force in the competition, taking control in the second quarter to lead by 20 points at half time. Whilst Wilston Grange took some advantage from the wind in the third quarter, they ran out of legs with Souths outrunning them around the ground to score 5 goals to nil in the final quarter to win convincingly! A huge game by the whole team, with standouts being Teddy (with a severely broken collar bone) Lazzo, Mutley, Pipes, Skull (looking very well tanned), Ezy and Ant. Vern showed some brilliance with some set moves adding to the complete team effort for one of the best wins the team has ever had. A huge year for the whole team, with sincere thanks to everyone for contributing to the most successful year in the club for many years. May 2012 be even better! Use the above link to let us know you can't play! 2018 Membership & AFLMQ Registration is now open. 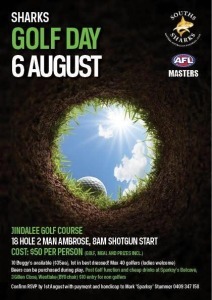 Click here for further details - you must be registered and paid your fees to play!!! Come and try us out, keep fit, and have a pile of fun! Old and new players welcome.